So what’s this last week of 2014 looking like for you? Is work is a little slow, with clients still on holidays? Or are you scrambling to get your last assignments completed this calendar year? If you’ve got a little time on your hands, spend your week getting ready for the new business year ahead. Here are a few things I’m going to be busy with. Get a head start on your tax prep and add up your business income for the year. I include all jobs invoiced in the current year, even if the cheque won’t arrive until January. Search out all your receipts and determine your expenses as well. If you’re not sure what items you can claim, do some research on the government tax website. As an editor, I can claim things like office supplies, printer ink, internet costs, dinners out for business (such as my editorial collective meetings or meetings with authors), and mileage for things like meetings or conferences. Fees for professional associations and online resources are other eligible expenses. Business use of home expenses involve some math as well. Get your spreadsheets and account pages all set up for the next year’s income. For me, this tends to take some time as I have to relearn some of those Excel tricks I use only once a year! It’s exciting to look at that blank page and imagine all the interesting jobs to come—think positive! Make sure to record your odometer reading on the last day of the year and the first day of the next—where are you going to keep this number for calculating next year’s mileage costs? One suggestion is a little calendar book in your glove compartment to manually record any trip miles as the year progresses. Or include mileage in your calendar app alongside each appointment. Is there a pile building up on your desk? It seems like paper is busy multiplying at night while we sleep! Get busy catching up on your filing so you start the new year with a clean, organized desk. Spend some time removing old files (I always keep two years’ worth of everything) and do some shredding or recycling. Are there things you would like to change this coming year? Think of ways you can work more efficiently and take concrete steps to put those changes in place. Some of my resolutions: start work each day on time, all dressed (! ); take the furry coworker for a good walk in the middle of each day (good for my brain too); drink more water throughout my workday; and spend less time on distractions like reading the news or blogs. How about you? What are you doing this week? 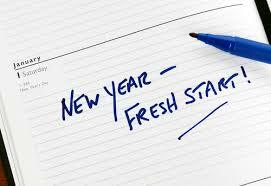 What new business year “resolutions” are you planning?